I typically have several posts in draft form waiting to be published, and none of them felt right for today. I was going to skip posting, since I don’t like force myself to write if I’m “not feeling it,” yet I feel compelled to post something. The events which have occurred in our country over the past few days have left me reeling, as I’m sure many of you are. I want to comment on what has happened, although I don’t know where to start. I feel horror, sadness, frustration, and I’m hesitant to voice my specific opinions in a public forum. It immediately brought to mind Jon Ronson‘s thought-provoking, semi-frightening book So, You’ve Been Publicly Shamed, which I read a couple years ago. 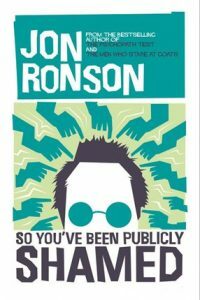 In it, Ronson chronicles his travels around the world to recipients of high-profile public shamings. 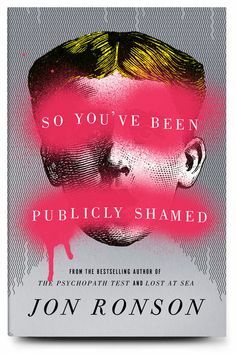 It’s a fascinating look at the phenomenon of public shaming in this current age of social media and instant news alerts. It’s a powerful book, both insightful and humorous, as is typical Ronson style. I highly recommend it! That sounds interesting. I’ve been fearful of what it means to have all kinds of public shaming. We get presented with information that seems like the whole story, but perhaps isn’t, yet a moment in time can have a life of repercussions. Honestly, I’m glad I don’t have to grow up in this current world. I shudder to think about how a mistake I made could have been immortalized.